Are You Looking For A Denver Airport Limousine? The Mile High City also known as Denver is one of the most popular city destinations in America. It is commonly known around the world for the friendly locals and beautiful landscapes, especially the astonishing Rocky Mountains. Denver International Airport is the one of the United States busiest airports, as well as the world’s 18th-busiest airport. In the world’s largest aviation market Denver International Airport is one of the busiest airline hubs. It is the primary economic engine for Colorado with approximately 58 million passengers coming through the airport each year, its a no brainer why it’s ranked as being busy! That being said the Denver Airport is most definitely one unique airport to be at. Another factor that makes the Denver International Airport known world-wide is due to the various and vast amounts of public artwork located throughout the airport. With such contrasts of paintings and statues along the walls and in the hallways it truly is an one of a kind place. With free WiFi it is easy to go surfing on the web to search more interesting facts about each piece their after taking a look around. 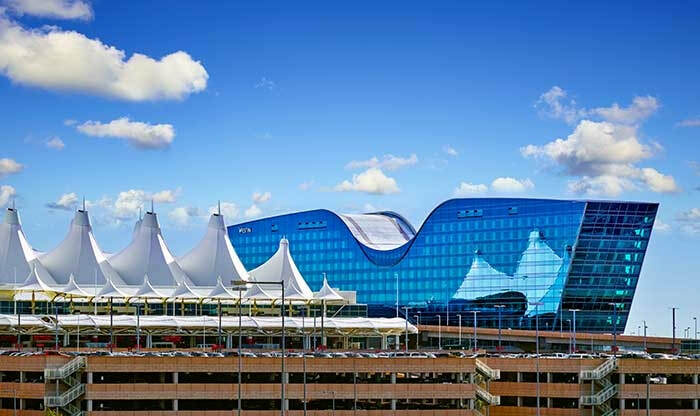 Denver International Airport is an environment that is hospitable and usually has a proactive way about creative, innovative and Eco friendly ways to deduct negative effects on the environment. You should be proud to come through the only airport in the United States that has in place ISO-1400, it is an environmental management system that strengthens programs to protect the environment. Compared to bigger cities like Los Angeles or even Miami, Denver luckily does not have as many inconveniences, however, getting to and from Denver International Airport can be a little more complicated than intended. That is where Denver Limousine Inc. is here to help! After a long tiring flight, no traveler wants to worry about how they are going to get to their next destinations even if they take a few minutes to check out the unique artwork. Denver Limousine Inc. gives unique Denver limo service that gives you exceptional chauffeur service, making sure that each traveler arrives at their designated destination in a timely manner and safely. It doesn't matter if you are a busy traveler for business or just a leisure traveler enjoying a Denver trip, our Denver International Airport transportation service is perfect for any travelers needs. Imagine this scenario: you have just touched down at Denver International Airport, you have now grabbed your luggage, you are now ready to explore the city. Then before you even get close to the doors you realize you never figured out how exactly you are getting there and your at least 20 miles from downtown Denver. I bet now would be a great time to have a friendly and prompt driver from Denver Limousine Inc. waiting for you in a clean, spacious and amenity equipt town car, SUV, or even limousine ready to get you safely to your next Denver destination. So why not choose a type of transportation that gives you the opportunity to travel in comfort and style when traveling to and from Denver International Airport? We can ensure that you will always be comfortable and be able to relax and sit back, or at the very least finish your work in a luxurious quiet setting on the road. If you are new to DIA then make sure to look for “Blue Mustang.” While you are relaxing in the back of one of our luxurious transportation vehicles feel free to roll down the window and look for Blucifer, the thirty two foot tall blue horse sculpture with glowing eyes. This meaning to represent the “wild spirit of the old time American West" , created by sculptor Luis Jimenez. If you are just stopping through on your way to one of the famous ski resorts, on a business trip or just flew into Denver over the holiday, our Denver airport limo and other transportation service will always be the best choice for your travel necessities. Denver Limousine Inc. is an inexpensive way to ensure that anyone’s travel needs are taken care of especially after tiring flights, typically costing close to around the same pricing for other Denver airport limousine or other car services. We always guarantee prearranged service to destinations throughout the Denver Metro area. We have been serving the transportation needs of individuals traveling through DIA for over a decade. Our longevity is afforded because of our dedication to giving High-quality customer service, and incomparable safety and reliability. Our chauffeurs will always be professional, adequate, and courteous and will have sincere integrity giving every experience the finishing touch. Our experienced drivers are all licensed and put through a thorough security background information checks and have complete knowledge about every single route ensuring that every passengers travel is well protected and that you arrive on time to every destination. Our Denver airport limousine service will always be committed to giving the top quality transportation services from and to DIA. Our variety of luxury transportation allows you the opportunity to travel with class and comfort. All of this is available at a rate that is inexpensive to accommodate your travel needs. Let us ensure your airport limo service needs are always met with satisfaction, always showing you the difference between an ordinary and simple car service compared to Denver Limousine Inc. denver airport limo service. Come Ride With Us Today! For over a decade Denver Limousine Inc. has set the bar for airport service in Denver. We have the perfect Fleet for both the leisure and business traveler. Our goal is to make sure you arrive to the next destination on time and safely. We make sure of that because our vehicles get inspected and maintenance every day. Every time that you get into one of our vehicles it will always surpass the standards one might expect from an average Denver airport limousine service. We seem to have a way with making you feel more relaxed and taking away the stresses out of traveling. Check us out today to find your private airport limousine or car service for Denver International Airport. Check us out online, book us over the phone and look forward to your next Denver Limousine Inc. ride. You will get to see our fleet of vehicles including sedans, all black cars, town cars or SUVS and assorted limousines. With us customer service exceeds expectations because we provide high quality, reliable and safe ride for leisure and business travelers coming through Denver International Airport. We guarantee that your rendezvous with Denver Limousine Inc. will be a wonderful hassle- free experience every time. Our Denver airport service only gets better with time. As we move forward into the year we promise to always try to be more innovative and creative with our services so that anytime you book with us it is always safe, enjoyable, easy and most important worth it!